This modest, modular, prefabricated pod has been designed with hinged, folded panels to facilitate their shipping and assembly. In its folded-flat configuration the lightweight pod fits on a flatbed truck so it can be transported to any desired location and then un-folded on site. Furthermore, it can be configured and expanded with additional pods into a variety of habitable combinations. 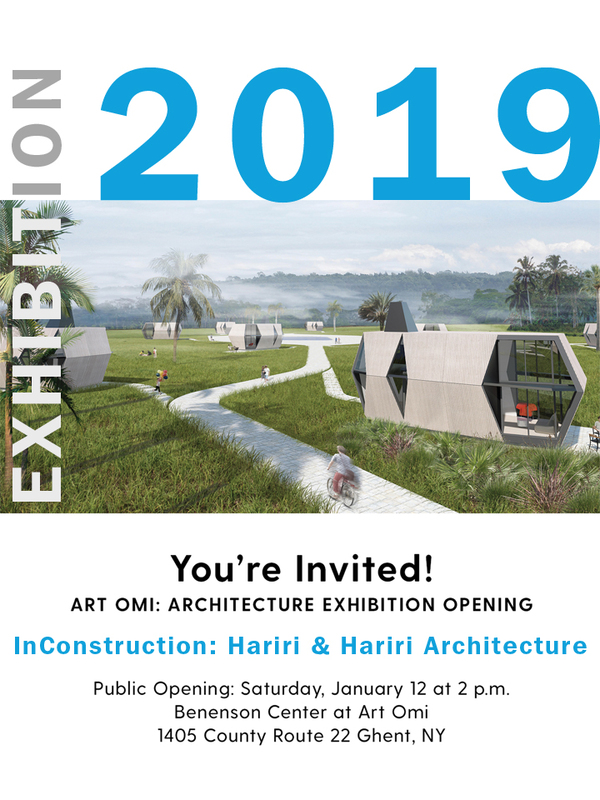 Hariri & Hariri Architecture’s philosophy and belief agrees with Art Omi’s guiding principle that artistic expression transcends economic, political, and cultural boundaries. To date, Omi has hosted more than 2,000 artists from over 100 countries. By inviting a unique and varied mix of artists, writers, musicians and dancers from all over the world to create a diverse, positive working community. Hariri & Hariri Architecture is excited to be one of the “Revolutionaries” working with Robbie Antonio in creating the “Modern Prefabricated House”. Revolution’s pioneering pre-crafted home concept was designed with a vision to simplify the process of owning your dream home, by your dream designer. Revolution allows anyone to handpick a design from a selection of carefully crafted homes, and own them with much ease. Each home is pre-crafted by world-renowned, preeminent architects, artists, and designers, making them sought-after designer homes that can be transported to wherever you are. Although Revolution seeks to provide convenience and efficiency, it doesn’t compromise its vision to offer something exceptional and delightful – a home that is not just produced but designed, not just fabricated but crafted. Seamlessly uniting the conveniences of a prefabricated home with the visual delight that only true masters of design can create.